We had a patient in this week who was celebrating their birthday! 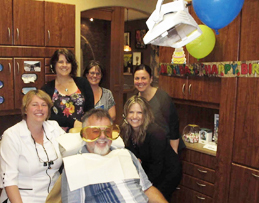 Of course, the Boardwalk Dental Team knew it was a "special" birthday for him and decided to celebrate - we think he looked pretty "COOL"! Thanks for sharing your day with us Terry! 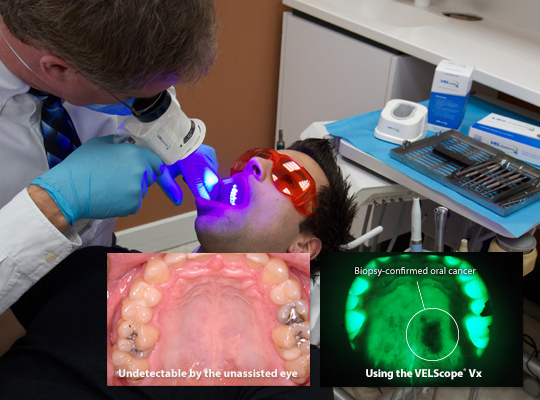 Boardwalk Dental Care is excited to share that we now offer enhanced oral assessments with VELscope® Technology. The VELscope® Vx Enhanced Oral Assessment System centers on a handheld scope that is used by dentists to help visualize oral tissue abnormalities, including cancer and pre-cancer. While it must be used together with and as a supplement to the traditional intra and extraoral head and neck exams, unlike others it does not require any dyes or prolonged testing procedures. In fact, a VELscope® Vx exam can be performed in the dentist's office in about two minutes during a routine hygiene exam. So how does it work? The VELscrope Vx emits a harmless, bright blue light which is used to inspect the mouth and tongue. The device is so sensitive to abnormal tissue changes that the distinctive blue-spectrum light causes the soft tissue of the mouth to naturally fluoresce. Healthy tissue is noticed as it tends to fluoresce in distinct patterns that can be visibly disrupted by any trauma or diseases, including fungal, viral or bacterial infections. Dentists are also embracing the use of this device to help visualize abnormal oral tissue such as potential cancerous or pre-cancerous tissues that are not apparent or sometimes not even visible with the naked eye alone. Because VELscope is now a part of the Boardwalk Dental Care enhanced oral assessments, exams are now more thorough and any suspicious areas can be quickly investigated for confirmation of oral disease. Its use in everyday practice can provide timely information to dentists and hygienists to enable earlier visualization of abnormal tissues and provide better outcomes for patients. Be sure to call Boardwalk Dental to book an enhanced oral assessment today!